We often think that ‘physician wellness’ is just a work thing, but the work aspect is just a spoke on the wheel. ▪ Emergency medicine physicians are at higher risk of burnout and suicide. ▪ We devote limited time to this topic in training and at conferences. ▪ We need to normalize the conversation about the stress of our jobs. ● Chris Doty sent an email to emergency medicine residency leadership across the country after a tragedy at the University of Kentucky. o “Dear colleagues. The unbearable has happened at the University of Kentucky. Last Friday we discovered that one of our residents was tragically taken from us. It appears that the resident took their own life in response to acute grief over a moribund family member. As you might imagine, the residency, faculty, department, institution in general and I have been devastated by this loss. I will not be sharing details about his death except that this was completely unexpected by myself and his resident peers. There was not an obvious history of depression or warning signs of impending doom. He was struggling with some significant family stressors but appeared to be processing those with support from the program. This is a catastrophic loss for our program and his family and friends. While I am immensely embarrassed that I lost a resident on my watch and guilty that I didn’t see this coming, this needs to be said. Honestly, I have struggled with whether I should write this email at all. I make this information public in order to shine a bright light on a problem that often lurks in the dark. Suicide, and specifically suicide in our trainees, is a significant risk and we are at higher risk than the general public. ● Why don’t we talk about this? It is contrary to the culture of medicine. ● We are at higher risk. 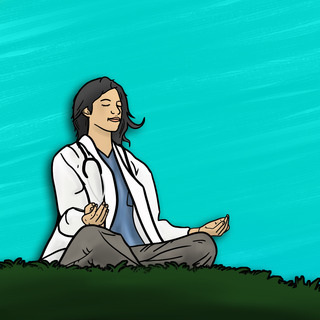 Emergency medicine physicians are at higher risk of burnout. We see this across all acute care specialties involving sick patients. We are on the front line to all the bad stuff that happens. It takes a toll. ● Mark Linzer MD identified 7 risk factors for burnout and they apply to emergency medicine. 1. You have a high tolerance to stress. 2. Your practice is exceptionally chaotic. 3. You don’t agree with your boss’ values or leadership. 4. You’re the emotional buffer. 5. Your job constantly interferes with family events. 6. You lack control over your work schedule and free time. 7. You don’t take care of yourself”. ● How do you define wellness? It is like spokes on a wheel; occupational, financial, spiritual, social, intellectual and physical wellness. We devote minimal time to this during training or national conferences. We need to turn more attention to these issues so we don’t burn out. ● We need to normalize the conversation about the stress of our jobs. We don’t talk about this with other doctors. It breaks the cardinal rule of medicine; don’t be weak. It is hard to go to your partner or director and tell them that you are feeling down about your practice and feel like a bad doctor. ● We all have these feelings. We don’t talk about our own depression or second victim issues. We don’t talk about anxiety or worries about patients. We don’t talk about medical mistakes or getting sued. We don’t talk about family issues. We don’t talk about our physical exhaustion or parenting difficulties. We don’t talk about illness in our family. We don’t talk about financial issues. ● What are some of the obstacles to wellness? The culture of medicine is that you can’t be weak. Mental illness and anxiety aren’t viewed as ok. Teaching wellness competes for time with all of the other issues we need to teach. We need to commit to teaching and learning about this. ● We need to be willing to talk about this. We need role models to stand up and say, “I was really depressed in residency.” “When I went through that lawsuit, I felt like a bad doctor for a while.” “I’ve struggled with anxiety my whole career.” Then it becomes normal. ● If you can see that this happens to all of us, it becomes normal. We need to acknowledge that this is a hard job. Commiserate, not correct. As Robert Wah MD said, the most important patient we have to take care of is the one in the mirror. I have heard so many lectures about this and feel like you are left with nothing at the end except awareness. It's like telling me about Brugada, how important it is, but leaving out a picture of the EKG and a not providing a s treatment pathway. This was the written program but email works better. Come on EMRAP tell us how to treat this hugely morbid and fatal disease: burnout and depression. You can do it! Thanks!! There are some papers on this now. West et al. wrote an article in the Lancet in September of this year (PMID: 27692469 ) where are they talk about some interventions that may help with physician burnout. It is my hope that this session on EMRAP lights a fire under the listeners and they demand more on this topic. I am happy to help lead this discussion if that is helpful. Tremendous kudos to Mel and his team for making this chapter free for everyone. It really shows the commitment to the listeners and other emergency physicians and how important people think this issue is. Lastly, several months ago there was an EMRAP chapter by Dike Drummond and Rob (May 16) where Dike talked about some strategies and practical ideas that you can implement at your shop tomorrow. 3. You don't agree with your bosses values or leadership. Noting that in in the larger sense my bosses and leadership are pushed by outside agencies such as CMS, JHACO, Pt "Satisfaction Scores." I find this to be amongst the top two things about work that makes me want to quit. To paraphrase a rap verse...."I never gave a .... about a metric because a metric never gave a .....about me. After 20 year of practice and because I keep myself up on the literature- rarely do I find myself stressed at work because of clinical load or clinical decision making or procedural challenges- except for the ridiculous and conflicting metrics that seemingly attempt to keep me running, like some rat in a lab-designed wheel, Bed to physician, LOS, LWBS, Sepsis metrics, STEMI metrics, CVA metrics, Trauma Level 2 activation....ooops, stop whatever you're doing and go right there.....three traumas in a row at 3 am but the family in room 12 is "Getting antsy" and that'll mean low satisfaction scores which will cost me 20% of my bonus.....and the beat goes on. At the end of the day, I realized that it was actually killing me, actually shortening my life, which means less time that my children will have me around. And those rules and those stressors are set up by people who never, ever, ever, ever, have to deal with the same stress that can cost them year off of their lives. So, I decided to let it go. I study every day, keep up, provide excellent care, treat my patients well, and delete the negative emails that try to tell me that since only 5/11 people of the more than 1100 I saw the last quarter, gave me a 9 or 10, I'm not a good doctor. I have had to say .....you to that sort of nonsense in order to save my own life. Wellbeing is important -how you are at the time . Also attitudes as regards how you deal with errors and how the legal system can be a real stress . There ought be a decade of anonymity re all errors unless due to malice -and open disclosure of errors leading to bad outcomes to teach others and as a catharsis and the patients ought be highly compensated . Great saves ought be remembered and remembered you have to tick yourself for good work . My hat is off to Dr. Doty for shining a light on an epidemic of massive proportions in our specialty. The 2015 Mayo Clinic survey reported prevalence of over 65% of all emergency physicians as burnt out. If more than half of us are burnt out, it cannot be just an individual issue, this is a systems based issue that needs systems based solutions! We need our specialty societies to advocate for us at the key drivers of burnout. I appreciate Dr. Doty's call for normalizing our conversations around the enormous stressors that we face in emergency medicine. I would also add that one the most powerful things we can offer to our colleagues when these conversations do happen is our own vulnerability. The statement "me too" is so powerful when we are struggling with things that for better or worse cause us shame and drive us to isolation. My hope is we can with kindness, gentleness and empathy walk with our colleagues through the tough times that inevitably happen in our profession. Thank you for your comments! I agree that a HUGE part of normalizing this conversation is to expose our own fears and vulnerabilities to those that approach us (and maybe those that don't) and let people know that these stressors, these feelings, these challenges are part of Emergency Medicine. Essentially, they are an occupational hazard for our specialty. Tribalism is strong in our specialty. Letting our colleagues know that these feelings often are mutual, and are an expected part of our specialty, is immensely powerful. It lets our colleagues know. that they are still part of our tribe. Just listened to this issue of EMRAP. I have been working with Dike Drummond for the past year. Would love to connect and see what you have going at your place.